There’s quite a bit more to channels and management of tokens, and we will overview most of the stuff you need to know to make your more complex widgets in this section. In essence, the basic idea about “multi-input” channels is that they can be used to connect them with several output channels. That is, if a widget supports such a channel, several widgets can feed their input to that widget simultaneously. Notice that everything is pretty much the same as it was with widgets from previous lessons, the only difference being the additional argument multiple=True, which says that this input can be connected to outputs of multiple widgets. Handlers of multiple-input signals must accept two arguments: the sent object and the id of the sending widget. """Set the input learner for channel id.""" OK, this looks like one long and complicated function. But be patient! Learning curve is not the simplest widget there is, so there’s some extra code in the function above to manage the information it handles in the appropriate way. To understand the signals, though, you should only understand the following. We store the learners (objects that learn from data) in an OrderedDict self.learners. This dictionary is a mapping of input id to the input value (the input learner itself). The reason this is an OrderedDict is that the order of the input learners is important as we want to maintain a consistent column order in the table view of the learning curve point scores. The function above first checks if the channel id is already in self.learners and if so either deletes the corresponding entry if learner is None (remember receiving a None value means the link was removed/closed) or invalidates the cross validation results and curve point for that channel id, marking for update in handleNewSignals(). A similar case is when we receive a learner for a new channel id. 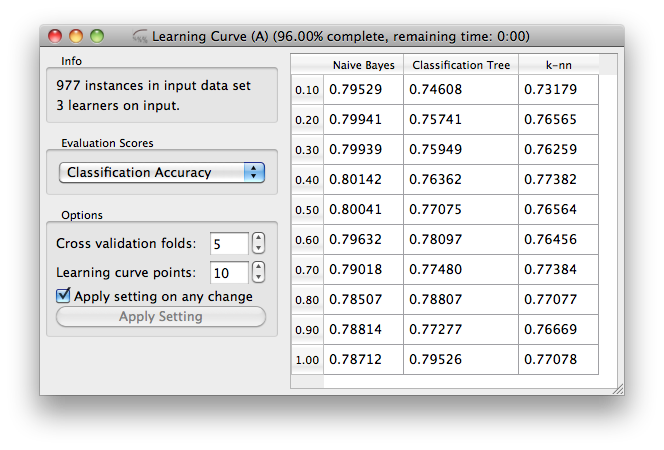 Note that in this widget the evaluation (k-fold cross validation) is carried out just once given the learner, dataset and evaluation parameters, and scores are then derived from class probability estimates as obtained from the evaluation procedure. Which essentially means that switching from one to another scoring function (and displaying the result in the table) takes only a split of a second. To see the rest of the widget, check out its code. 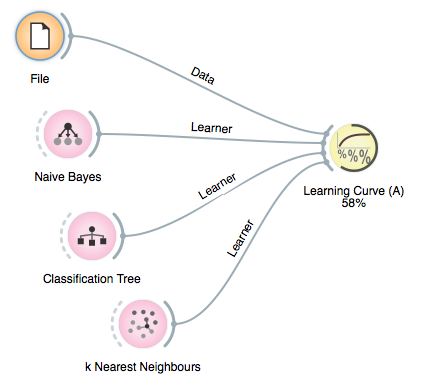 Now, let’s say we want to extend our learning curve widget such that it does the learning the same way as it used to, but can - provided that such dataset is defined - test the learners (always) on the same, external dataset. That is, besides the training dataset, we need another channel of the same type but used for training dataset. Notice, however, that most often we will only provide the training dataset, so we would not like to be bothered (in Orange Canvas) with the dialog which channel to connect to, as the training dataset channel will be the default one. That is, no window with a query on which channels to connect to will open, as the default “Train Data” was selected. 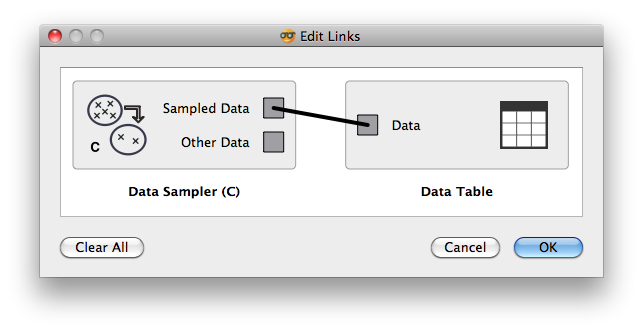 Sometimes when a widget has multiple outputs of different types, some of them should not be subject to this automatic default connection selection. An example of this is in Orange’s Logistic Regression widget that outputs a supplementary ‘Coefficients’ data table. Such outputs can be marked with and Explicit flag, which ensures they are never selected for a default connection.